When it comes to planting trees, mulch is a tree’s best friend. Mulch is the material that is spread around and over a tree to help enrich the soil for a tree’s healthy growth. Covering the ground with mulch is a quick, affordable, and efficient way to make sure your tree has a healthy life. When you drive around the state, you might not realize, but most Oregon coast trees—especially those in residential neighborhoods—are regularly maintained with mulch. This is an important step, particularly for newly planted trees. So, let’s get into the details. 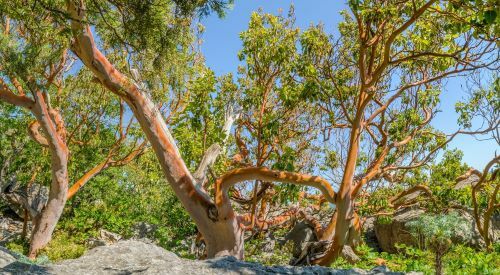 Nearby areas, such as the land Oregon coast trees sit on, offer soil that is enriched with organisms and vital nutrients. Unfortunately, a typical yard doesn’t offer these same amenities to support growing tree roots. In fact, yard soil is usually nutrient depleted and subject to drastic environmental and temperature changes. Mulch is the remedy to these problems. It insulates the soil to add a buffer from hot and cold temperatures. It is also used to help with nutrient and water retention, root moisture maintenance, weed control to avoid competition, and as protection of soil organisms. The technique you use to lay down mulch will vary based on the kind of mulch you use. Make sure to also purchase enough mulch to cover the area. Factors such as affordability, appearance, and maintenance will help you determine which mulch is the right one for your trees. Shredded or chipped bark is a popular option for those who don’t plan on doing too much digging. It is made out of tree and shredded into different size pieces. Be sure that bark pieces are two to four inches deep within the circle and that they are used a few inches away from the trunk of a tree trunk to avoid rot damage. Compacted manure, a version of compost, is another option for mulch. 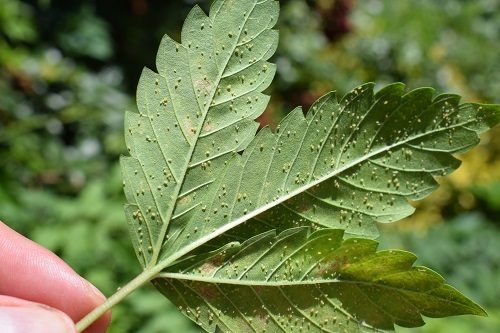 It is an organic material and can be used mostly anywhere that is weed free. Grass clippings are a free way to mulch, but is mainly used for lawns and gardens. They are best suited in areas where you want to suppress weeds. They contain a great amount of nitrogen and potassium that also lets them serve as a supplemental fertilizer. However, grass clippings decompose rapidly and can tend to mat down to the point of where water can’t flow through, so use with caution. Shredded leaves are nature’s favorite mulch because they can be used anywhere. Many don’t like the look of leaves in the garden, but if you mulch in the spring before the plants grow out, the shredded leaves can blend pretty well. What is the proper way to add mulch around trees? Before you add the mulch you must clear the grass within a three to ten feet area around the tree. You should pull the weeds out of the lawn and dig out the weed roots as well. It is vital to make sure weeds don’t grow under the mulch. Use a chemical weed killer if needed. 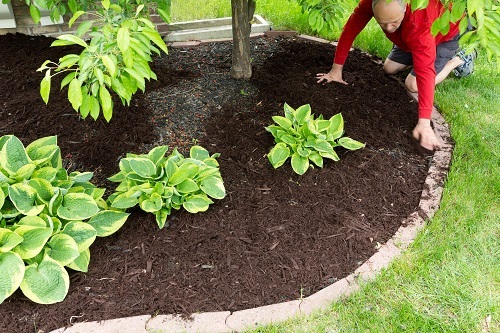 Remove existing mulch using a shovel and make sure that the old mulch is removed before the new is added. You can transfer the old mulch via a wheelbarrow to discard it. From a wheelbarrow, shovel small piles of mulch in the areas you will be adding the mulch to. If you just dump all the mulch in one area, the tree’s roots will suffocate. Once you start to see dark brown soil roots then you’ll know you removed enough mulch. The old mulch can be placed in a compost pile to be broken down. Use your shovel to dig around the area you want to mulch. This will help keep the mulch off the grass. Don’t toss soil into a flowerbed, otherwise it will promote grass growth in the mulch. If you don’t want to use a shovel you can use stone to create a barrier to prevent the mulch from touching the grass. Water the soil before you apply the mulch. Then pour the mulch a couple inches deep within the circle. Make sure the mulch doesn’t touch the tree trunk at all. The mulch area should extend to the drip line of the branches. The larger the mulch area, the better. Rake the mulch in an even layer. The layers will vary in size depending on the time of year. For newly planted trees you, try to use organic mulch. Water organic mulch to give it moisture and prevent it from being blown away, but be careful not to overwater. Replace organic mulch every year around the same time. Inorganic mulch can be replaced when it no longer looks fresh. Mulch can be applied at anytime of the year. Apply organic mulch in the early summer or end of spring in order to get the best results. It’s during this time that the soil is warmed up and plants are out of dormancy. 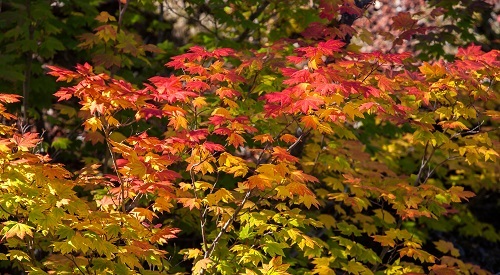 Applying mulch in the late fall can also help slow the freezing process, which is beneficial for the tree as well. Fall and winter mulch creates an insulated barrier between soil and air to protect the roots from the changes in temperatures. When the weather changes drastically, like where our beloved Oregon coast trees grow, the right mulch for the right season is essential. While mulching is a great way to care for your trees each year, this is just one component of tree maintenance. If you need guidance with this or any other tasks—from pruning to shaping, and even removal—reach out to your local tree service company.